It was the best of times: two wildly fun cities. It was the worst of times: facing issues brought on by mass-tourism. You might be wondering if the internet really needs another “guide to” either of these iconic cities? You’re right…it probably doesn’t. Or at least, it doesn’t need another generic guide highlighting all of the tourist traps. Yes, go to the Colosseum and the Roman Forum. 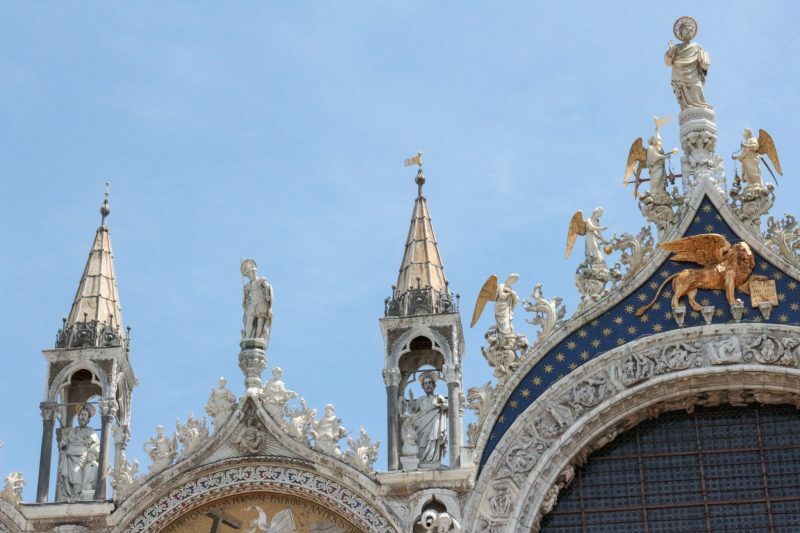 Yes, go to the Doge’s Palace and San Marco Basilica. 100% you should see these monuments if your heart desires. We can’t tell you not to travel somewhere that you’ve always wanted to go. What we can tell you is that how you travel matters. You have choices when traveling. While it might not always be comfortable to think about how your choices impact something or someone, it can ultimately lead to a more authentic way of living. 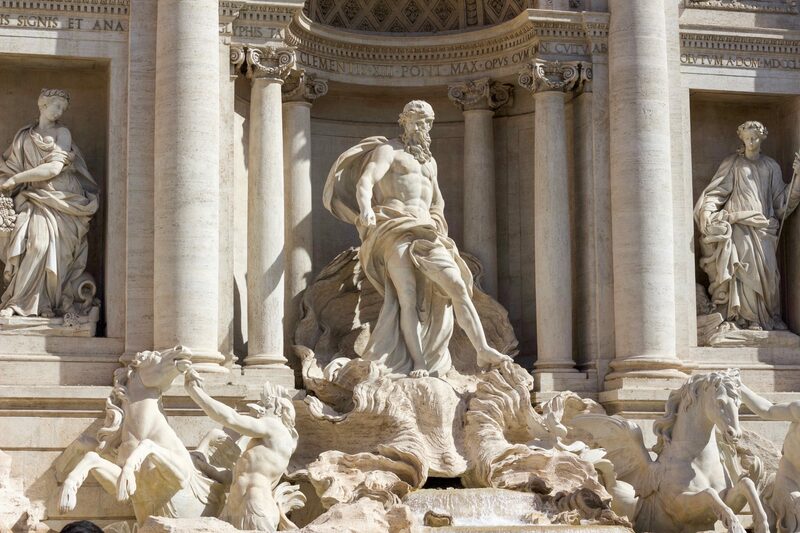 The Trevi Fountain in Rome. Photo by Misty Foster. So this is a tale of two ancient cities. Both places are actively looking at ways to preserve the past while embracing modernity. This is our take on how to visit them in a responsible manner and the places we think are doing a stellar job at changing the game and deserve your support. A cafe in Rome. Photo by Misty Foster. Ahhh, Roma! The eternal city. It’s easy to get -willingly- lost in the labyrinth of historical sites, shops, and restaurants. Where Rome differs, is in its effortlessly cool attitude. Italians know that they have so much beauty around them, there’s no need to rush. Take it slow and take it all in. After all, this is the country that started the slow-food movement! Romans are growing weary of the way people mindlessly visit their city. Believe it or not, there have been tourists who’ve tried to dip their toes in the Trevi Fountain or try to take a stone from the Colosseum home with them. Tourism can be ugly and problematic. It can also be inspiring and anyone who has been to Rome or lived there will tell you that it’s a magical place. If you show up in a respectful manner, with a curiosity to learn and experience, you’ll be paving the path for future tourism to thrive. Where you stay, eat, shop and play matters. Do your research and find places that are supporting the community, environment, and local economy. Here are GST’s favorite spots for Rome. The Beehive Ho(s)tel- The Beehive Hostel will hit traveler’s sweet spot on value without compromising on style and comfort. A quick 10-minute walk from Termini Station and you’ll arrive at the eco-conscious accommodation, that caters towards a variety of travelers. For those who may be adverse to staying in a hostel, the Beehive steers more towards the boutique hotel vibe. The private quarters or “Sweets” are large, cozy, and inviting and perfect for someone who craves a bit more privacy. “The Sweets” at the Beehive. Photo by Misty Foster. Throughout the hostel, you’ll find charming decorative touches and an overall happy vibe. Owners, Linda Martinez and Steve Brenner are an active part of the operations and you can sense how much love and care they have put into making this place a welcome refuge for guests. That passion also extends to their ecological and ethical beliefs. For them, it’s more than a marketing ploy: it’s a way of life. 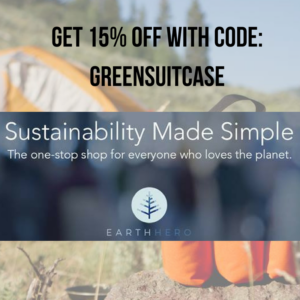 While they tick off the standard “green” boxes for things like using eco-friendly cleaning products, LED lighting, vegetarian kitchen, and recycling, they also go deeper with some of their community initiatives. They collect and donate clothes to the local homeless population, support refugees, and more. One can also enjoy community events at the hostel 7-days a week! Learn to cook with Steve, take a yoga class, or enjoy an evening apertivo in the garden. Once a month, the space transforms for their popular storytelling group, where people from all over the world gather to share personal narratives. 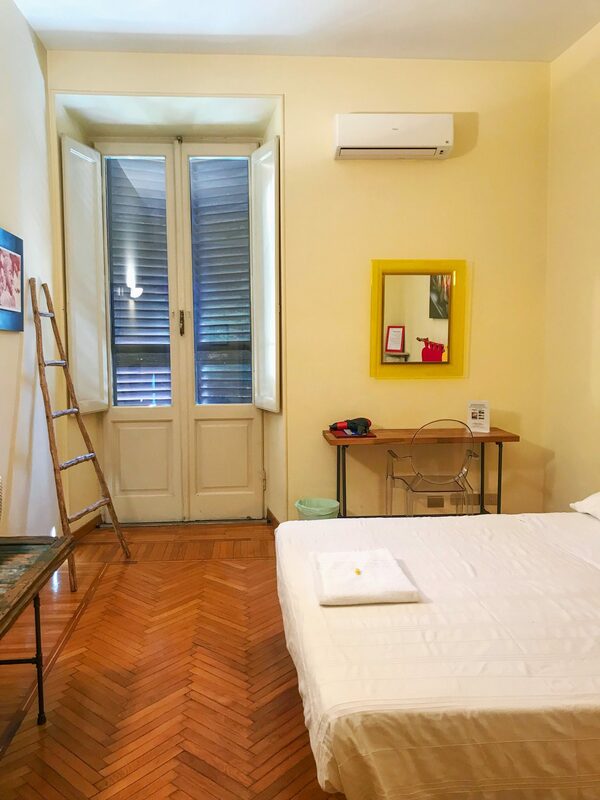 Staying at the Beehive is enhanced only by the fact that you are so close to all that Rome has to offer. If you need suggestions for exploring the area, use the Beehive’s app with a curated collection of local restaurants, shops, and activities. Alternatively, Linda offers tour guiding services of her favorite hidden gems in the area. The Sanctuary Eco Retreat– This chic, open-air space is a playground for the stylish, mindful sojourner. Part restaurant, part wellness space, one can find yoga, meditation, tea ceremonies and more, here. Fatamorgana Gelato– Organic and natural gelato with unique flavors like the Thumbelina with Sorrento walnuts, rose petals, and violet flowers. Enoteca Bulzoni– A champion of naturally produced wines and spirits from Italy. Fiore– Flexetarian cuisine (mainly plant-based) with a focus on raw cuisine. Urbana 47– local ingredients, hand-made food, and a food philosophy built on one word: quality. 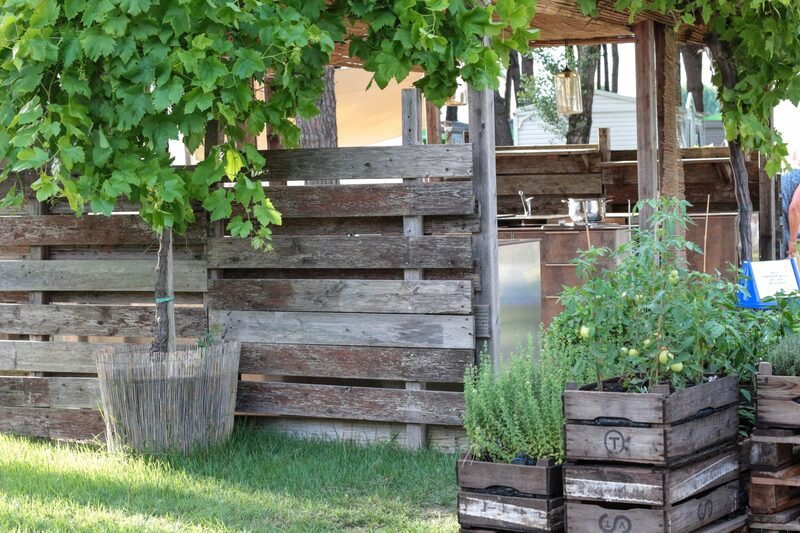 Podere Vecciano– This cute shop sells organic wines, alcohol, food, and hand-crafted kitchen goodies. A great place to stock up on goodies to bring home. Podere Vecciano. Photo by Misty Foster. Humana Vintage– Rome is a hot spot for vintage lovers. Here’s a great guide to all of the vintage shops you can find. We like Humana Vintage because of their people to people business model and their support of social programs throughout the world and Italy. OOD– Get the Italian bag at OOD. The father-daughter duo is leading the way in craftsmanship and sustainability with their bags. 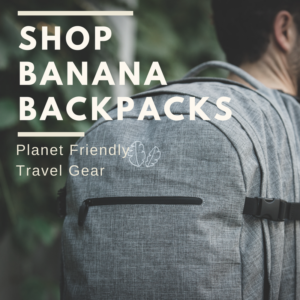 They patented their own alternative to leather called, Ligneah® made from biodegradable wood. And they make everything in their studio in Rome! Never touch the Frescos and respect the signs around museums, churches, and monuments. For God’s sake, please don’t litter and, it should go without saying, but don’t try and take home a piece of the ruins! Get political. Find out what the political climate is like and if your dollar supports something you do or don’t believe in. Eat seasonal foods. Italians are good about doing this anyway (hello slow-food), but if you see something that looks out of season on the menu, skip it. Take a walking tour and work with a local operator like LivItaly. Visit the parks, gardens, and lesser-known neighborhoods. 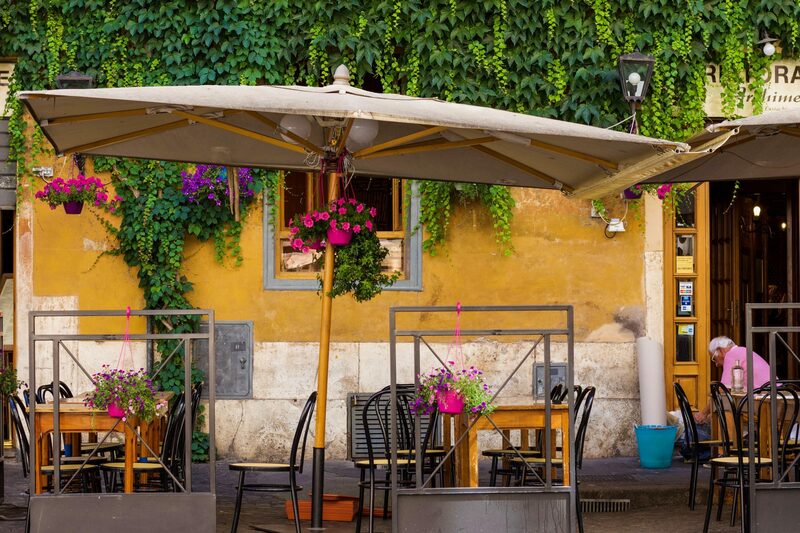 Cool neighborhoods to explore: Trastevere, Monti, Celio, San Lorenzo. 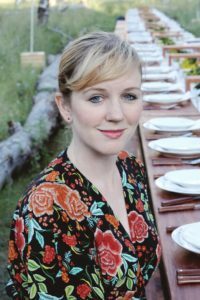 Take a private-personalized cooking class like the one offered at the Beehive. Take public transportation. Buy a Roma Pass and buses and the metro are included. Join a social impact experience. Tipping in Italy is not necessary. You can round up if you have loose change or if you had truly exceptional service. Don’t touch fruit and vegetables with your bare hands in open markets. Most markets provide gloves for handling food. Dress appropriately when visiting churches. If you go in with a tank top on, you will be asked to cover your shoulders with a cloth. The streets of Venice. Photo by Misty Foster. Let’s face it…Venice, Italy is one of those places that many dream of visiting. It’s a city unlike any other in the world, with it’s winding canals and alleyways, colorful buildings, and intriguing history. Venice practically embodies romance and mystery. In some ways, Venice has always been ahead of the curve. The only way to get around is by walking or taking the vaporettos (water taxis). It’s a car-free island! That said, the UNESCO World Heritage Site is not without its issues. You may have heard that Venice is sinking due to climate change. And while that is a truth, the bigger issue is mass tourism. Tourists outnumber the locals two to one and the cost of living has increased due to demand from tourism. The only way Venice can truly be preserved is by its inhabitants who are passionate about keeping it afloat. But the increase in tourism has created a demand for cheap, imported goods and tourist traps. Now, the locals are faced with keeping up with the influx or leaving. A big culprit in Venice’s mass tourism comes from huge cruise ships dropping off hundreds of people for a few hours and then leaving. Not to mention the incredible amount of smog and pollution cruise ships bring in. Despite UNESCO’s desired cruise ship ban, the city relies on tourism and city officials are having a hard time trying to strike a balance. How a traveler responds to this complicated situation is vital. While avoiding Venice altogether may not be the answer, changing the demand in favor of localism could be. 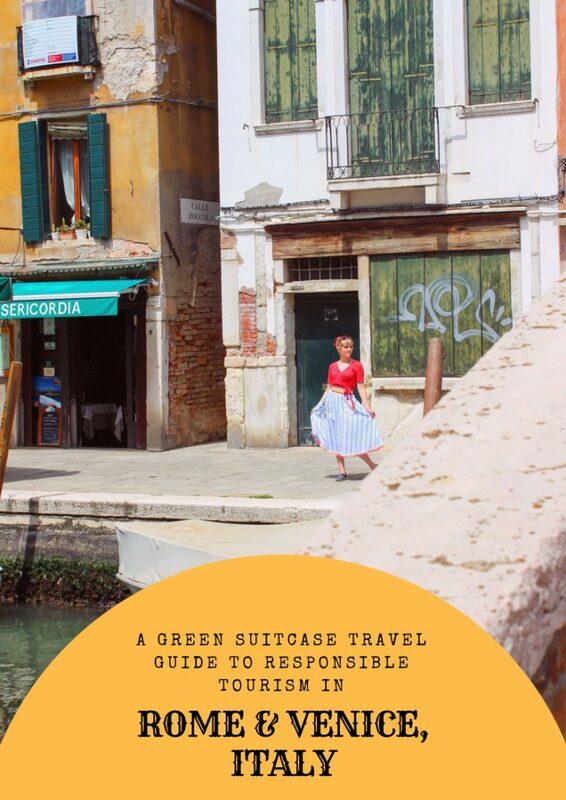 Here’s how Green Suitcase Travel suggests visiting Venice responsibly. Get Hygge with it in Venice! It’s super easy to do at the Nordisk Village in Venice. Because of the mass-tourism issues, Venice is currently grappling with, staying on one of the surrounding islands is a great alternative. Not only will you still be close to the city, you’ll save money, and will be making a smaller impact. The tents at the Nordisk Village in Venice. Photo by Misty Foster. 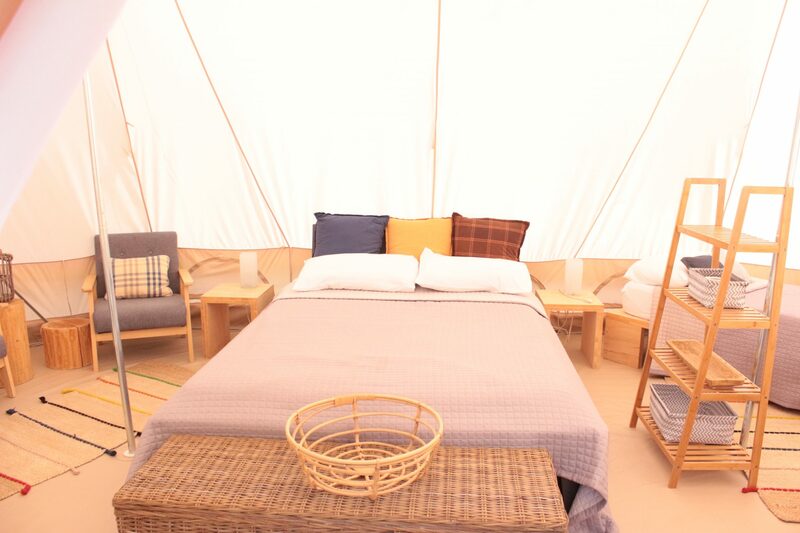 The Nordisk Village is the perfect option for responsible travelers who like glamping! The Nordic style campground is a short ferry ride away from the mainland and surrounding islands like Burano, Murano, and San Michele. Part of a larger camping village called, Ca’Savio, the low-impact campground is designed where everything can be packed out, leaving an untouched environment. And the 10 Vanaheim cotton tents are situated in an open layout, facing each other to encourage an element of sharing. A communal, outdoor kitchen sits in the middle of the campsite where campers can enjoy cooking their meals from the organic garden that sits right next to the kitchen. You’ll have access to everything you need during your stay including a grocery store, pool, and even a gelato shop! Walk or bike to everything you need on the campground including a pristine beach a few meters away from the tents. The shared kitchen at the Nordisk Village. Photo by Misty Foster. Visitors to the Nordisk Village will enjoy the chic and cozy interior of the tents, which fit up to four people and come stocked with reusable dishware, towels, and low-energy lighting. The tents are a great option for families, couples, or solo travelers to explore Venice and the surrounding archipelago. Il Mercante Venezia– sustainable & craft made cocktails. Cooking & Traveling– Take a cooking class in a Venitian home with a local. Osteria da Baba– organic, sustainably sourced seafood. Vgloso– plant-based, vegan, organic Italian cuisine. Libreria Aqua Alta– An adorable locally-owned bookshop named after the seasonal flooding that happens in the city. All of the books are in bathtubs, gondolas, and waterproof bins to keep them intact when the floods do come. Il Canovaccio– Handmade Venetian masks. The owner and her father personally handmake and paint the masks, and each one is unique. A MUCH better option than the plastic masks you’ll see in kiosks along San Marco Square. 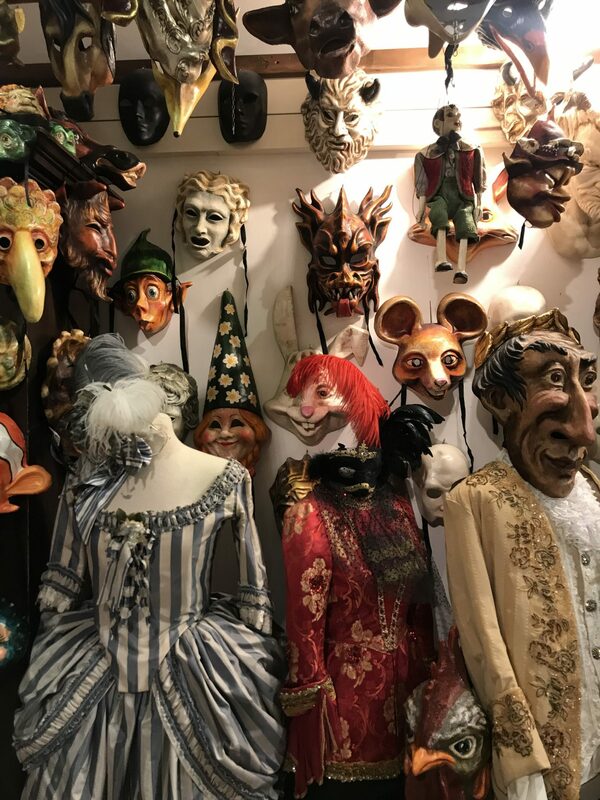 Masks and Venetian costumes at Il Canovaccio. Photo by Misty Foster. Piedaterre– Beautifully crafted, Venetian furlane shoes made from recycled materials. Made locally. Don’t swim in the canals. Observe signs asking visitors not to sit on the steps. Try traditional Venetian cuisine like sarde in saor or fritole. EXTRA GOOD NEWS: The spritz is a classic Venetian cocktail, so drink (responsibly) away! Walk on the right side of the streets to help reduce congestion and foot traffic. Visit Venice during the off-season, when it is less crowded. July-September is high season. Do not eat or drink in St. Mark’s Square and do not feed the pigeons. Show the surrounding islands in the lagoon some love! 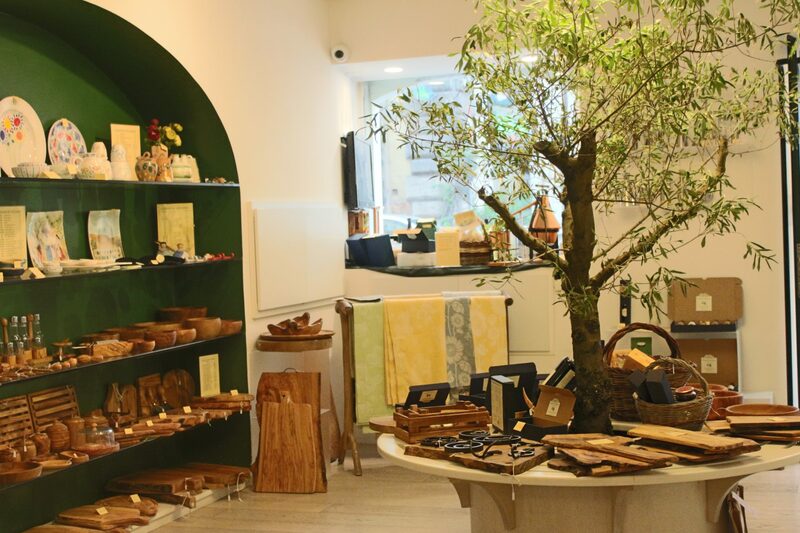 Buy from local artisans and try visiting their workshops. Get out of St. Mark’s Square and visit some of the less congested neighborhoods. 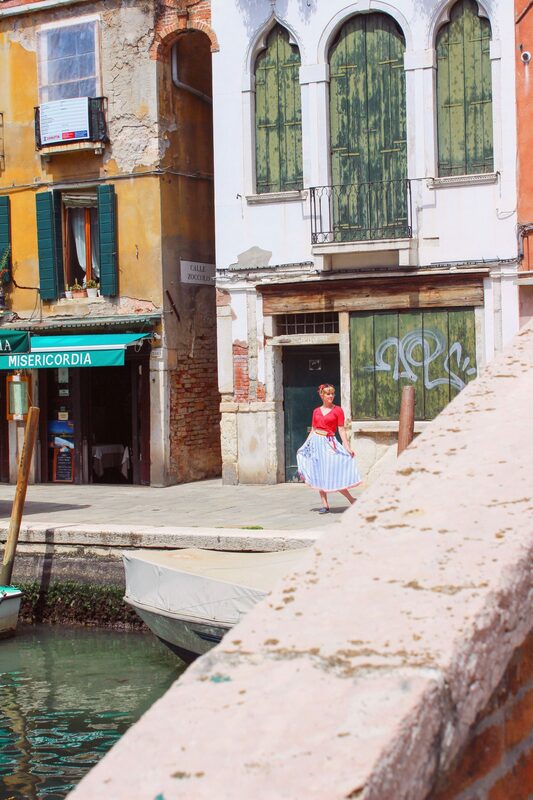 Cool neighborhoods to visit: Cannaregio, Dorsoduro, Castello. Don’t litter or vandalize (this should be obvious, but….). Get to know a local and ask them where their favorite spots are and businesses they like to support. Take a vaporetto to get around, but remember this is the local’s form of transportation, so use it respectfully. Don’t visit Venice via cruise ship. 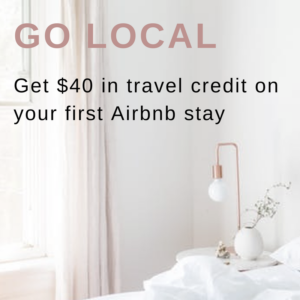 Stay more than one day if you visit the city, so that your dollar has a greater impact. Visit the city of Venice’s sustainable tourism page for more on their #EnjoyRespectVenezia campaign. A quick note on getting around Italy: Getting from city to city in Italy is fairly easy to do via train. Trenitalia is the primary train operator and tickets are generally inexpensive. It is suggested to make an advanced reservation if traveling between major cities. That said if you are planning to visit Tuscany, the Amalfi Coast, Lake Cuomo, or anywhere in between, getting a car is a better option. 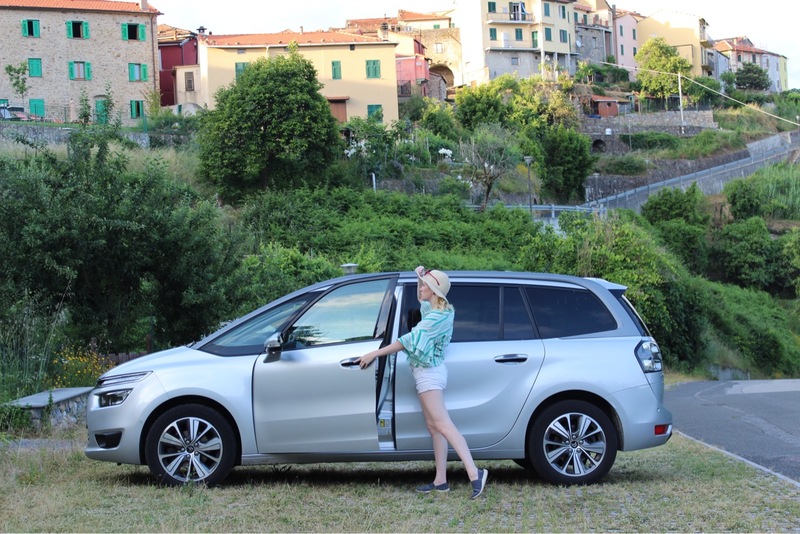 We recommend Green Motion Italia if you need to rent a car. Their entire fleet is low-emission, hybrid, or electric. Did we miss something? 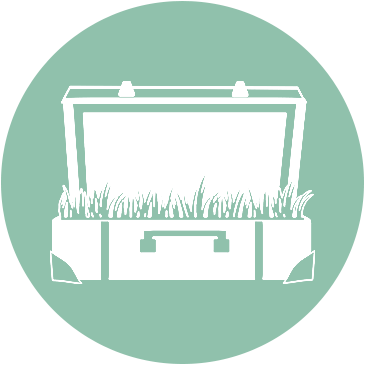 Do you have more suggestions for sustainable tourism in Rome or Venice? Drop us a note, we’d love to chat!